As the list of subscribers shows, Peter Frederick contributed £4 to the Methodist meetinghouse to be raised in Adolphustown. At that time, he was living on a farm about a mile east of the church site, in neighbouring South Fredericksburg (Additional) Township, on the south shore of Hay Bay. An 1808 census shows that he had only cleared 35 of the 365 acres he owned. That was not an indication of a lazy farmer, for his chief occupation was that of a blacksmith. Indeed, Peter probably manufactured much of the hardware for the meetinghouse–the immense quantity of nails to attach the flooring, siding and shingles, plus hinges, door fasteners, locks, etc. He and his wife Mary raised three boys: Peter Jr., John, and Oliver. 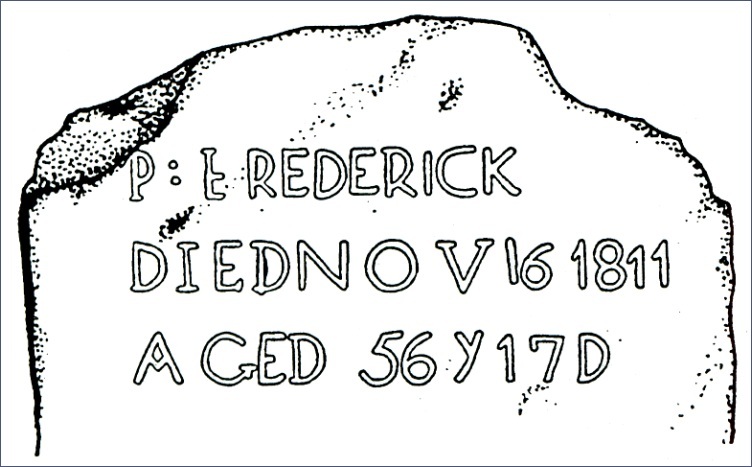 Peter Frederick’s name appears on the old U.E. List, with the information that he was a Sergeant in the King’s Orange Rangers. There is no record of a Loyalist Claim submitted by Peter. With this scant information, and the help of Peter Johnson of Toronto (U.E. genealogist and military buff), we are able to make these educated guesses about his background and wartime service. The Orange Rangers were a Loyalist unit raised by Lt.-Col. John Bayard, mostly from Orange County, New York, on the east side of the Hudson River, and north of Bergen County, New Jersey. Many Loyalists came from this area, forming at least four battalions of the Jersey Volunteers, as well as the Orange Rangers. Among several places where the Rangers served, were the New York City area, and in Halifax, Nova Scotia, where they garrisoned the fort to free British soldiers for service in the American colonies. One Muster Roll of August, 1778, shows him as Corporal Peter Frederick in Capt. Andrew D. Barclay’s company. Peter Ruttan (who also became a 1792 subscriber, and whom we shall write up in a later issue), lived in the Ramapo Mountains on the border of New York and New Jersey, and was an avid recruiter for both Loyalist units. He brought in 60 men for the Jersey Volunteers, and later raised 40 men for Bayard’s Orange Rangers. It is quite likely that Peter Frederick was one of those recruited by Ruttan. Other Orange Rangers who settled in the Quinte townships include Matthew Benson, Daniel Cole, Sgt. James Demorest, and Frederick Post. Our subject may be distinguished from some other Loyalists of the same surname. There was a Peter Frederick who served in the 3rd Battalion of the New Jersey Volunteers, mostly in the North Carolina arena: from 1779 to 1783, he is listed in the muster rolls as a “prisoner of the rebels.” There was a third Peter Frederick (possibly the same as the one just mentioned) who was a private in the Orangeburgh Militia of Orangeburgh, North Carolina, in 1780. A John Frederick is described on the U.E. List as “came into the province in 1786.” He settled on the 4th concession of Thurlow, and served many years as Town Clerk. Two German brothers, Lodowick and Barnet Frederick, came from the Mohawk valley, served in the K.R.R.N.Y., and finally settled in Matilda township near Iroquois. And finally there was a Conrad Frederick, a Sergeant in the Jersey Volunteers, who came from Bergen county. He also settled in the Belleville area, on the front of Thurlow. He was probably related to our subject, and was certainly, as we shall see, a trusted friend. The year 1811 proved to be a momentous one for Peter Frederick. On 6 June his son John, who would inherit the farm, brought home his new wife, Elizabeth, daughter of Paul and Layna Peterson. Rumours of an impending war with the Americans were rife and startling in this community so close to the border. The militia were being called out in readiness, and on 9 October, Isaac Brock was appointed as Administrator of Upper Canada, a position he well served until his death on Queenston Heights a year later. In the fall of that year, Peter, aware of failing health, faced his mortality and imminent end. In his will of 9 October, he bequeathed his Fredericksburg farm to son John, made provision for his wife, insisting that John care for her, and that she be “used Kind and in a Brotherlike manner.” His blacksmith tools were divided between the two older boys; each also to have “a beehive with its bees and honey.” Peter Jr. was given 500 acres of land in Huntingdon township, north of Belleville in Hastings county, land which his Loyalist father noted had been “granted me by government.” This son also was to receive, in addition to a variety of livestock and furnishings, “fifty young apple trees,” indicating that an orchard had recently been planted. To provide for his third son, Oliver, Peter Sr. willed another 200 acres in Huntington to John, half of it to revert to Oliver when he reached maturity at age twenty-one. Oliver may have died while young, for, unlike his two brothers, he never applied for his land grant as a son of a Loyalist. The estate of Peter Ferguson was valued at £644.17.04. He was not a poor man. In another dimension, it was a happy time for this man who had fostered the earlier vision of a Christian church in his neighbourhood. Playter, in his History of Methodism in Canada, has left this one sentence portrait of Frederick: “he wavered in his religion, but returned to the Lord, and died very happy.” Was he beckoned back to faith by his neighbour John Roblin, one of Losee’s converts who became a local preacher? In his will, he appointed John Roblin and Conrad Frederick, whom he describes as “my trusty friends,” as executors along with his wife Mary. Born on 31 October 1755, Peter died at the age of 56 on 16 November 1811. He was the first of the twenty-two subscribers to die. His curious “home-made” tombstone is the oldest surviving stone in the Hay Bay Methodist cemetery, and is pictured below. Sources: Peter Frederick’s Will is available on microfilm at the Ontario Archives: Wills, GS 1-1223; probated 28 January 1812. Several articles have appeared in Fidelity, the journal of the Toronto Branch UEL Assoc., on the family of Col. John Bayard and the King’s Orange Rangers, written by Peter Johnson and Peter Mitham. See Vol. 17, Nos. 5,6 & 7, March, April, May, 1995. Mitham also tells the story of Col. Samuel Vetch Bayard, brother of John, whose dramatic conversion to Methodism in 1804 in Nova Scotia, is also chronicled in T. Watson Smith’s History of the Methodist Church in Eastern British America (1877).